India Post Circles: Andhra Pradesh, Assam, Telangana, Odisha, Delhi, Jammu Kashmir, Haryana, Rajasthan, Bihar, Himachal Pradesh, Gujarat, Jharkhand, Chhattisgarh, Madhya Pradesh, Kerala, Himachal Pradesh, Karnataka, Madhya Pradesh, Maharashtra, Punjab, Tamilnadu and West Bengal total 23 Postal Circles. 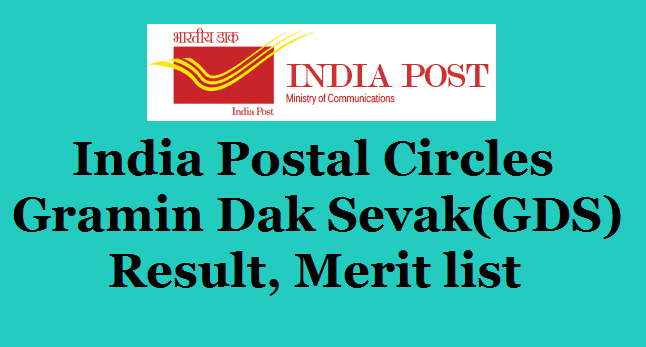 Indian Post office has started to recruit plenty of GDS/Gramin Dak Sevak in all Indian Postal circle. To regain the Indian post office glory once again, Indian Government announced that they will take every possible measure and they have already started taking initiative by releasing Indian Post office recruitment vacancies for all its circle. They started the procedure by releasing Gramin Dak Sevak or GDS vacancies earlier in March and April 2017 and in altogether they have the plan to recruit over 50,000+ vacancies all over India which will be sweet enough to run the Indian Postal circle smoothly. *First of all, candidates are required to go to the official website of India Post office @ www.indiapost.gov.in. *When they are at the home page of Indian Postal circle they have to locate the Gramin Dak Sevak *Result 2017 at the middle of the page in “current notification” section. *Click on that and a new window will appear containing all circles result list. *Click on your circle’s GDS result and a new pop-up window will appear and that will prompt you to *download the PDF file. Download it on your local drive. *That PDF file will contain all successful candidates list for that circle. *Look for your registration number or Name. If it is present there then your are provisionally selected. *Wait for the next instruction from the Indian Postal Circle Authority.